Kids are going to LOVE this unique baseball award that's actually 2 awards in one! The resin features a bronze textured "V" as the backdrop, embellished with a gold star, and full color baseball, bat and glove. The "V" sits atop a base that has ample room to personalize for your event. Around the top of the base is the bonus award, a black and yellow baseball wrist band that can be taken off and worn! This award is double the fun with one to display on their shelf, and one to wear on their wrist! Comprised of simple geometric shapes, this award will match any environment. The baseball is unattached to the base so it can freely rotate. 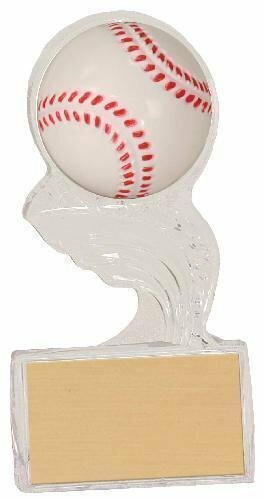 5" x 2 1/4" x 2 1/4"
6 1/2" x 3" x 3"
8" x 4 1/2" x 4 1/2"
This clear one piece, free standing award features a 2" diameter 3 dimensional baseball riding on a sculpted "splash" wave. The wave is highlighted with black, adding depth and dimension. The large area for personalization allows you to customize for your event for a very economical award. 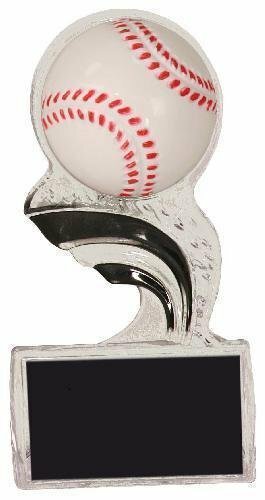 This clear one piece, free standing award features a 2" diameter 3 dimensional baseball riding on a sculpted "splash" wave. The large area for personalization allows you to customize for your event for a very economical award. This modern resin design features a silver victory "V" embellished with gold stars and stripes that supports a full color baseball. Standing on a black base that has plenty of room to personalize for your event, this budget friendly award will knock it out of the park!